Anjou Citronella Essential Oil's natural properties make it the perfect companion for your summer holidays. It is an all natural mosquito repellent that will keep your skin smooth and sting-free all day long. Plus, the product doubles as an after sun lotion to sooth your skin in case of sunburns and lighter irritations whilst infusing it with a delicate and refreshing fragrance. Regular compresses of hot water and the citronella essential oil help you fight the main symptoms of the athlete's foot, like itching, burning, pain, scaling, and related bad odor. When applied onto the face, the essential oil shrinks the skin pores and minimizes visibility and occurrence of blackheads. When it comes to wellness, Anjou puts its foot down. Enjoy all of the benefits of the aromatherapy with Anjou. Let the citronella fragrance infuse your rooms as well as your soul and feel the tension release breath after breath. Feel relieved. Feel the peace. Feel and sleep better with a fragrance that takes care of you all day long, even at night. Feel free to mix Anjou Citronella Essential Oil with your favorite homemade natural products such as soap, body lotions and creams, massage oil, etc. Explore all of the ways to benefit from its refreshing fragrance and soothing properties. Do not limit wellness, embrace it and make it yours. Anjou Citronella Essential Oil is 100% pure and cannot be applied directly on the skin. Mix with water or other oils before application. Test your skin sensitivity to the product. Start with low doses and make sure the product does not irritate the skin. 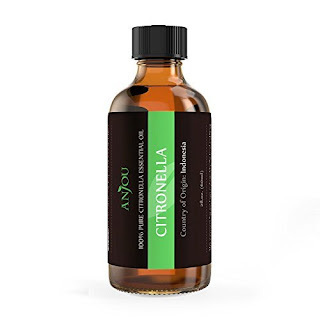 Citronella Essential Oil by Anjou is an amazing product! We have mosquitoes so bad right now that my kids haven't even been able to go outside without being bitten at least a few times. I can even see them buzzing around my kids while they color on the patio with chalk. I added some of this Citronella Essential Oil by Anjou to some coconut oil and had them rub it on before going outside the other day and the mosquitoes were gone. My girls also came inside itch free as the mosquitoes left them alone. I decided to try it myself since I'm one of the lucky ones that mosquitoes tend to prefer and I didn't see a single mosquito around. Citronella Essential Oil by Anjou works wonders to repel mosquitoes and I highly recommend it! Relieve stress, calm the nerves, and unwind from a busy day with Anjou Orange Essential Oil. Pair it with the Anjou Diffuser and bathe in a soothing scent that is both mentally and physically uplifting. The essential oil better balances hormones such as cortisol - the chemical infamous for causing stress - so it's an all natural way to manage extra pressure. Even children can benefit from its calming properties so they fall asleep without disturbance. Healthier and fresher skin can be yours for the first time. Our essential oil supports collagen formation, increases blood flow, and better absorbs vitamin C - all of which promote anti-aging. Fight against irritated, acne-ridden, blemish-prone, dry, or inflamed skin so you look cleaner, clearer, and better than ever before. Health may not be everyone's priority, but it should be. And thanks to Anjou Orange Essential Oil it's easier than ever to boost your immune system so you're more resilient against colds, flu, and other maladies. Our essential oil also helps stimulate your lymphatic system which plays a big part in overcoming infections and chronic illnesses. Our essential oil also works both as a digestive stimulant and a mild antispasmodic to ease indigestion woes as well as to relieve constipation and cramps. No need to shell out for expensive cleaning goods when the ultimate DIY treatment is sitting in front of you. Containing limonene - an active agent for fighting bacterium and other surface-level germs - you have the ideal solvent for cleaning stains and others marks. Also use it to produce a pleasing aroma that immediately minimizes bad smells and noxious odors. Sweet Orange Essential Oil by Anjou is wonderful! I love to make homemade cleaners so this Sweet Orange Essential Oil by Anjou is one of my favorite oils. I love adding it to my cleaners because not only does it smell amazing but it also kills bacteria. Literally every room I use my cleaners in that contain this oil smell amazing. It instantly freshens the room and cleans the air of any funky smells. I also love using this Sweet Orange Essential Oil by Anjou in my diffuser because it disperses well and fills my whole house with a wonderful orange scent. The air in my home literally smells clean and fresh days after I use this oil in my diffuser. Sweet Orange Essential Oil by Anjou is definitely one of my favorite oils and I highly recommend it! Bottled in the USA with ingredients sourced directly from the best locations around the globe, Anjou Peppermint Essential Oil is a 100% pure therapeutic grade essential oil with uncompromised quality. It contains no fillers, no synthetics, and no additives, only the purest herbal extracts and all the goodness of peppermint essential oil. Peppermint Essential Oil is known to stimulate your nerves and clear your mind. When your day is dragging, the refreshing aroma of peppermint oil will relieve your stress and mental exhaustion, and give you increased focus and a boost of positivity. Peppermint is a natural insect repellant. Its aromatic smell, while pleasant for humans, will deter mosquitoes, rats, cockroaches, spiders, ants, fleas, and other insects away from your home and family members. The intense cooling sensation of peppermint can help reduce pain and headaches. When applying diluted Anjou Peppermint Essential Oil to problem areas, it will reduce swelling, relieve pain, and eliminate uncomfortable inflammation. Peppermint Essential Oil by Anjou is a wonderful oil! When I feel a headache coming on I usually place this oil in my diffuser and within minutes my head feels better. I also love how fresh and clean in makes my whole house smell. Peppermint oil is definitely an oil I use to boost my mood because it has a cool and refreshing scent and just seems to make me feel better. It could be that it smells like candy canes and reminds me of Christmas but none the less it works to help me feel better. Peppermint Essential Oil by Anjou is a great oil to use to beat headaches before they turn into dreaded migraines or to boost your spirit come Monday morning when it time to go back to work. Peppermint Essential Oil by Anjou smells terrific and I highly recommend it! Benefit from the pink grapefruit's natural drainage properties and get the right push in your strive to lose weight. This essential oil stimulates the lymphatic system, which plays an important role in your body's detoxification mechanism, and gets you all the good stuff out of it. It fights slow circulation, fluid retention, and even the appearance of cellulite. Used on a regular basis, the pink grapefruit essential oil promotes skin tone quality and firmness. The vitamin P deeply cleanses the skin pores and regulates sebum secretion to minimize the visibility and occurrence of black heads. Whereas the vitamin C improves skin brightness and overall firmness while boosting your immune system. Enjoy all of the benefits of the aromatherapy with Anjou. Let the freshness of the pink grapefruit essential oil infuse your rooms and feel the tension release breath after breath. A soothing effect on the body as well as the soul that will help you feel better and more serene day after day. The versatility of Anjou Pink Grapefruit Essential Oil makes it ideal to mix with shampoos and conditioners to fully benefit from its oil secretion regulation properties. A 5-to-10-minute application conditions scalp oil balance and boosts hair repair. Get your hair what it needs to look healthier and feel better. Get it right. Get Anjou. Anjou Pink Grapefruit Essential Oil is 100% pure and cannot be applied directly on the skin. Mix with water or other oils before application. Do not drink. Do not combine with food. Grapefruit Essential Oil by Anjou is perfect to perk up your whole house. I love to use this Grapefruit Essential Oil by Anjou first thing in the mornings to help my family wake up and get the day started. The fragrance it has is amazing. It smells just like fresh squeezed grapefruit juice. I don't have a ton of experience with grapefruit oil but I used this oil in my shampoo and my hair seemed to have more volume and looked incredibly shiny. I also think it made my shampoo foam up a bit more which seemed to really help cleanse my hair. I also really liked that my hair smelled fresh and clean after I shampooed and that even when dry my hair still smelled incredible. I love this Grapefruit Essential Oil by Anjou and highly recommend it! Mosquitoes and other insects are annoying but are even worse when they leave your skin feeling itchy. The Lemongrass Essential Oil acts as a natural insect repellant that's safe on your skin so you can enjoy a safe night out that's entirely bug free. If your skin is particularly oily and is causing your pores to dilate and become noticeable, lemongrass essential oil, after long time use, can regulate skin to reduce pores. Simply mix it with carrier oils such as jojoba, argan, coconut, etc. to have a clearer, rejuvenated finish. It also works as a toner by strengthening skin tissues resulting in a healthier and purer look. After exercise, your muscles can be sore or a tense; relieve those aches by massaging the oil onto those tender areas. When applied, enjoy improved blood circulation, which in turn provides a relief from pain, cramps, tension, and muscle spasms. There is a rumor heaven smells like lemongrass and after one whiff, you'll be inclined to agree. Using the Anjou Diffuser, you can use as is or mix with other scents. Either way, the intoxicating aroma will brighten your mood leaving your home smelling heavenly. Anjou Lemongrass Essential Oil has antibacterial properties, so it's a natural disinfectant for fighting germs and bacteria. Cleanse the air of formaldehyde and other chemicals that can linger after a new home renovation. Also use it as a natural sanitizer and wipe down the floor, furniture, or other surfaces found in the home. Lemongrass Essential Oil by Anjou is my absolute all time favorite oil! I absolutely love the smell of lemons and lemongrass is very similar so I really like this oil. I use this Lemongrass Essential Oil by Anjou just about daily in my diffuser in my kitchen because it seems to freshen and cleanse the air like nothing else. When I come home my house smells fresh and clean, even when it isn't. This Lemongrass Essential Oil by Anjou is also a favorite of mine to add to cleaners. It instantly freshens and makes cleaning day a little more bearable. Lemongrass Essential Oil by Anjou is also a natural disinfectant so it's perfect to add to your cleaners to help disinfect your home. Lemongrass Essential Oil by Anjou is awesome and I highly recommend it!